Decide on your style of handrail spindle from a selection of designs, including traditional, Colonial fluted, stop chamfer, stop ovolo, Oxford, Georgian, twist, provincial and square plain spindles. Complement these with your other wooden stair parts easily as they can be made from yellow southern pine, ash, oak, hemlock, pine, white primed softwood or sapele. 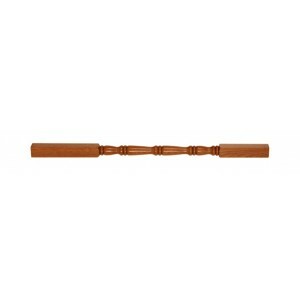 Spindles support the handrails from the baserail and can be used as a decorative feature to enhance a bannister. A selection of 41mm x 41mm landing handrail spindles for use in balustrade when it continues across a landing. When used on the landing, spindles should be 1100mm so the handrail will be the correct height. Our traditional balusters incorporate five pairs of inset beads into the turned area for a highly decorative yet tasteful look. We think this type of baluster looks best when lacquered and polished to a high shine, making the most of the smooth, light-catching curves of every bead.